This Changes Everything: Capitalism vs. the Climate. By Naomi Klein (New York: Simon & Schuster, 2014), 566 pp. $30.00 cloth. During the Cold War, “comrades” through groups such as the Red Army Faction, the Carlos gang, or the Germany Revolutionary Cells waged insurgent war against the American-led global capitalist system; and their anti-imperial and anti-capitalist views continue to inform the discourses of sympathetic academics, journalists, filmmakers, and human rights activists, including Canadian writer Naomi Klein. Concern for the poor and oppressed—or as a communitarian Galilean put it, “the least of these”—is a worthy and noble cause, but the left has too often indulged in irrational and alarmist attacks against systems and institutions that have helped provide opportunity, security and stability to a significant portion of the world’s population, with the volume under review a highly representative case. 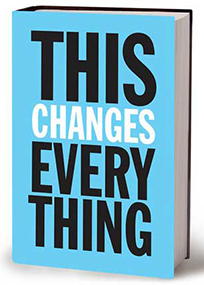 In This Changes Everything: Capitalism vs. the Climate (2014), the author of Disaster Capitalism (2007) forcefully argues that global capitalist ideology has precipitated unsustainable global warming, employing the reasoning and invoking the history of the true or hard Left. “We have not done the things that are necessary to lower emissions,” Klein asserts at the outset, “because those things fundamentally conflict with deregulated capitalism, the reigning ideology for the entire period we have been struggling to find a way out of this [climate] crisis” (18). In broad terms, the first two-thirds of the book (“Bad Timing” and “Magical Thinking”) condemn various manifestations of what Klein describes as “free market fundamentalism,” by which she appears to mean an uncritical latitude regarding the activities of major corporations and the profits they seek to accumulate that has completely overcome “virtually every government on the planet, every major media organization, every university, indeed our very souls” (62). We Earthlings have thus far proven unable to respond to the environmental imperatives of climate science on account of the economic incentives of laissez faire capitalism. Klein’s initial chapters—if in a less than linear fashion—review the scientific consensus on the necessity of keeping global temperatures from exceeding about 3.5°F above pre-industrial levels, and take aim at Republicans, the Heartland Institute, the Reagan administration, and other readily imaginable targets. More interesting is her coverage of how the neoliberal regulations of the World Trade Organization (WTO) can punish local communities that attempt in various ways to self-determine renewable energy. Ontario for example had arranged a communitarian renewables system that deliberately limited foreign involvement, but which by 2012 was producing more solar energy than any other Canadian province. The transition came to a sudden end, however, when the EU and Japan complained to the WTO, which ruled against Ontario (67-69). Klein also communicates her anti-globalist stance in her amusing examination (ch. 7) of how celebrity billionaires like Virgin’s Richard Branson have publicly pledged strong climate action but in reality accomplished nothing. She cites for example Branson’s practice of offering bargain priced flights through his Virgin America venture—which he initiated merely a year after he “converted” to environmentalism through various conversations with Al Gore—as being in conflict with his public pledge. And in the book’s finest instance of investigative journalism (ch. 8), Klein eavesdrops on a geo-engineering conference in the English countryside in 2011 and describes how the various schemes being floated by the scientists to reduce world temperatures—improvised volcanic eruptions, cloud brightening, space mirrors—are all highly fanciful and extremely dangerous, as well as unrelated to the essential task of ceasing to emit greenhouse gasses in the first place. Such proposals also, in Klein’s view, perpetuate the imperio-dominant Weltanschauung that originally inspired the malicious excesses of the capitalist world economy: “Unlike cutting our emissions in line with the scientific consensus,” she concludes, “succumbing to the logic of geoengineering does not require any change from us; it just requires that we keep doing what we have done for centuries, only much more so” (266-67). Part III of This Changes Everything (“Starting Anyway”) is an extended attack on “‘extractivism,’ a term originally used to describe economies based on removing ever more raw materials from the earth, usually for export to traditional colonial powers” (169). Chapters 9-13 provide in essence a sociology of the petroleum industry, considering its relentless pursuit of new reserves, the dangerous activities attempted once they are found, the resulting usurpation of local ways of life, and finally the civil disobedience necessary to nullify the process. The reader is cordially invited to join the ranks of BLOCKADIA, in which comrades are rising in Romania to challenge Chevron, to help the Elsipogtog of New Brunswick against SWN Resources, or to rally in Washington, D.C. against the Keystone XL pipeline, among other places. For global Northerners whose communities have thus far escaped the curse of hydraulic fracturing, you are encouraged to divest yourselves entirely of any stake in the fossil fuel industries, such that they eventually become unacceptable in polite society. A major dimension of this climate justice movement concerns indigenous rights, since it is their native communities that are so often threatened by oil and gas exploration. “Many of the planet’s largest and most dangerous unexploded carbon bombs lie beneath lands and waters to which Indigenous peoples have legitimate legal claims” (375). The implied thesis is that both international law and national governments have failed to satisfactorily obstruct the major oil companies, and that what remains therefore is local mobilization against their ongoing, rapacious operations. Klein’s overarching narrative of capitalist aggression encountering communitarian resistance is incomplete in at least two major respects. First, there should have been a chapter on the enormous extent to which the Third World has voluntarily assented to the extractive capitalist system. All twelve OPEC member countries, most importantly, are global south, with regimes such as Kuwait, the Emirates, and Venezuela based on fossil fuel exports. The Sultan of Brunei with his thirteen children and fleet of Rolls-Royces might have made a cameo appearance. Yet accounts of Third World complicity in the fossil fuel economy would clearly disrupt the author’s binary distinction between an imperialist West and an exploited Rest. Second, Klein perpetuates the same major omission of generations of Marxian scholarship: neglecting to satisfactorily formulate the intervening role of the state in the continual unfolding of class conflict. And yet this overlooked constitutional dimension is of supreme importance to both the origination and solution of the climate emergency. Klein’s beloved Hamburg, for example, may indeed be “Germany’s second largest city” (96), but more importantly it is one of the sixteen Länder with representation in the upper-house (Bundesrat) of the German Parliament, and with its own constitution ( 2009) that endows the citizenry with the right to initiate a referendum (50.1). Such local rights do not exist in neighboring France for example, being a unitary republic. And it must seem obvious that the only powers on earth capable of altering our dependence on fossil fuels to the extent Klein demands are the political authorities of liberal democracies, which she unfortunately writes off almost entirely. To conclude, Klein’s ostensible purpose is to utilize the protest politics of the Left to save an endangered climate; but by the end of the book I found myself wondering whether or not the reverse may in fact be her true if subconscious intent. Is Klein attempting to mobilize the political Left to save an imperiled climate, or is she invoking the climate crisis in order to try to salvage an imperiled Left? Consider the following: “The massive global investments required to respond to the climate threat…could deliver the equitable redistribution of agricultural lands that was supposed to follow independence from colonial rule and dictatorship; it could bring the jobs and homes that Martin Luther King dreamed of; it could bring jobs and clean water to Native communities; it could at last turn on the lights and running water in every South African township. Such is the promise of a Marshall Plan for the Earth” (458). Such passages do nothing to reassure conservatives that responding to climate change need not induce socialism and world government. Yet we as conservative stewards can nevertheless constructively respond to Klein’s provocation. Theodore Roosevelt was one of our nation’s most accomplished conservationists, and a conservative. He also fought to rein in the excesses of Gilded Age capitalism, but with a very different goal in mind. He sought to save capitalism from avarice and corruption in order to prevent the spread of socialism. Other conservative icons such as Russell Kirk and Richard Weaver often warned against the influence of large corporate interests and the corrupting power of greed and materialism. Tory Conservatives in Britain and Christian Democrats in Continental Europe have also long provided mature conceptual answers to environmental challenges, yet Klein appears completely unaware of such schools of thought. Natural egoism must be checked and subdued, but preferably without demonizing an economic system that incentivizes success, including that of Simon & Schuster, Klein’s corporate publisher. While her blame is chaotic and her solutions questionable, conservatives can find common cause with Klein on responding to environmental degradation and problems like climate change. We must not in the final analysis equate any multi-national corporate malfeasance with the egalitarian framework of liberal political economy, the original thesis of which was that no one and no thing should arbitrarily be placed on an unequal footing. Feel free to tell that to The Anglo-Persian Oil Company, British Petroleum, BP, Beyond Petroleum.